Whenever you have sequels to really strange mystery thrillers like this, you have to realize that it must be difficult to think of a plot. I mean the first was a plot that didn’t really require much actual story, it was just…mathematical and escape. How do you really make a sequel about a giant cube with traps? Well, I guess by changing the cube itself. Cube² is a really interesting film, and if I remember correctly, it was the first in the series that I actually ever saw. Now that I saw it again, I still consider it really fun, but as a whole, the first one was better. The first film introduced us to a giant cube housing at least 17,500 rooms that were 14 cubic feet each. Now, some of the rooms differed because every now and then the people in the cube ran into rooms set up with deadly traps. The rooms in Cube² are still 14 cubic feet, there are still a bunch of seemingly random participants, and there are still deadly traps…that much remains the same. The difference is how ridiculously sci-fi this film is. They changed the cube into a hypercube, or tesseract – a cube that adds a fourth dimension into the equation. In short, that means that all bets are off. These rooms alter time, gravity, have multiple alternate realities…the list goes on. Also, instead of 17,500 rooms, there could be 60,000,000 rooms. Basically, they raised the bar. The only thing they have to go off of is a random number – 60659. If you want a movie that has really smart writing, then watch the first film, when it comes down to smart mathematical writing that is unrelenting, that’s where it was at. Cube² was just interesting and fun. If you’re a big sci-fi nerd where the laws of physics don’t apply to you, you’re probably just going to love it. 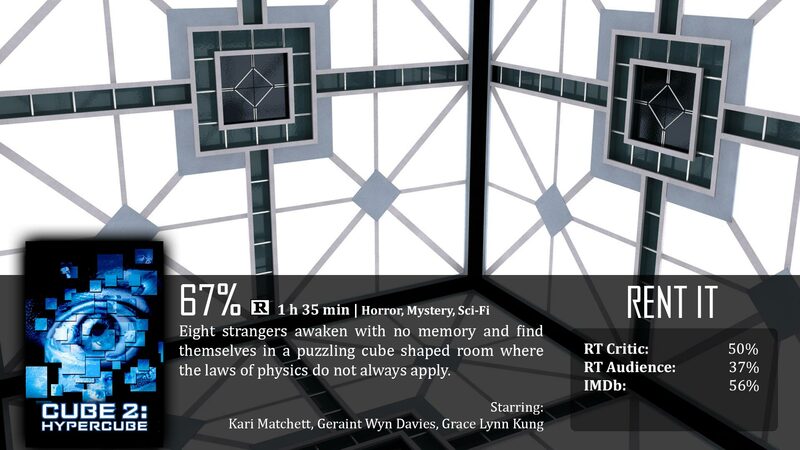 Hypercubes and tesseracts and fourth dimensions…a lot of that is just theories, so the film ran on ideas rather than actual equations like the first. What that changes is intellect, all they have is a random static number to go off of. I won’t spoil anything, but that number’s reason was a plot device, it doesn’t offer any logical explanation of where it actually came from. The first film had a lot of talking and explanation of how they got to that logic. No, I didn’t really understand half of what they were saying, but it was captivating. If you want the same effect, look elsewhere. This is just here for fun. My main complaint about the first film was the acting. I never had any problem with the characters, just the acting. Now I’m torn, because the acting in this film was split between okay and bad. There still wasn’t great acting, but for a film like this…who would expect any? I did, however, have a problem with two of the characters specifically. The senile old woman and the homicidal maniac. First of all, that lady was one of the worst actresses, was incredibly annoying, and I couldn’t believe her character in the slightest. She doesn’t seem old enough to be senile, and her dialogue was horrid. The maniac was just too much like one of the first film’s characters. The rest of the characters I more or less enjoyed. 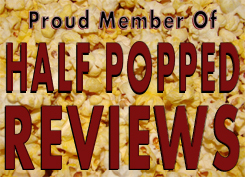 As a whole, you shouldn’t view this film as anything other than just fun. It takes everything you love about science fiction and replicates it in the most intriguing way. No, not all of the visuals look all that great, but it’s the premise that should interest you the most. I’ve seen all three films before, but I’m interested in seeing Cube Zero again…should be interesting. Random note…why isn’t it called Cube³? The premise of Cube is still readily apparent, but their plot shift is at least welcome. We don’t want the same movie over again, so that’s pretty awesome that they were able to change it in such a way. I also think the change was pretty smart. Overall, it’s just really, really fun. It’s not smart like the first film, it’s just fun. One of the best parts of the first film was being so well thought out and full of math and science. This one was science fiction…which kind of changed things in a negative way. They also overshot their potential by making a fourth dimension unrestricted in what can actually happen. Some of the characters were also really dull and even annoying. Jerry Whitehall: Each one of these rooms has six of these doors and portals, but no matter how many different doors and portals I go through I always end up in the same three rooms.